This week I listened to a couple CB discs, which gave rise to an interesting finding. I was hoping the young Järvi would be one to find freshness and profane exhilaration to the ol' chestnut. That was not to be. Although the sound is suitably big and spacious, the myriad rythmic inflexions go for practically nothing, and the choir never seems to have fun singing the text. Last year I had listened to the Jochum version for the first time, but I was not bowled over, finding the sound too bright and "in your face", with insufficient depth. This time around I was much less bothered by the sound - let's call it "very immediate" instead - and could relish the astounding musical feats from the chorus (prepared by the legendary Walter Hagen-Groll) and Eugen Jochum's laser beam eye for detail. I sometimes felt his conducting slightly rigid and unbending, but whenever doubts started to creep in, something miraculous happened - not the least being the three soloist's extraordinary contributions. Stolze's sonorous head voice, DFD's "chummy" yet incredibly beautiful singing, Janowitz's hair-raising Dulcissime. I'll put on Jochum's earlier DG recording from 16 years earlier (mono, 1952) for comparison. It clocks in some 30 seconds faster. If memory serves, only one of the soloists had met with my approval. But things change. 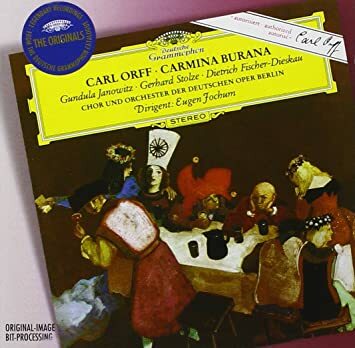 I don't know too many recordings (stereo Jochum, one of Kegel's and Fruhbeck de Burgos) because I can take the piece only once in a long while but overall Jochum has hold up very well. As you point out, the soloists are amazingly good there. Janowitz is great and it is hard to believe that someone could beat Stolze as the roasted swan (although I can imagine that some find it to exaggerated) or Fi-Di who is comically the pompous in "ego sum abbas cucaniensis" and really passionate later on (circa mea pectora multa sunt suspiria etc.). The sound is not great but Jochum has a feeling for the fun and swagger of the piece. I didn't hear the Blomstedt. I have the Kegel and Frühbeck, as well as MTT, Ormandy, Ozawa (2 versions), Thielemann, Dutoit, Hill, Dorati and the first Jochum recording. I got rid of a couple recently. Not all are worth hearing more than once. Dutoit, MTT and Ozawa in Berlin are really excellent. When it comes to savouring the text, I think I'll go back to Jochum and his Berlin Opera forces and glorious soloists. Jochum was a Bavarian through and through. I suspect he had an innate understanding of these old bavarian poems and drinking songs. It's because you want it to be raucous. The Blomstedt is arguably, in my view, the best one out there. The soloists are incredible - sensual, innocent, and soaring where needed (and always in good control) . They bring out the beauty and create more of a story of episodes (I don't skip around anymore). The clarity is brilliant. It's one of my favorite features. I can listen to this recording often (my ears don't get tired) - I notice details I don't hear in other versions. It stops to smell the roses. I don't know how long it was after my initial exposure to this in middle school before it dawned on me that there is no harmony in the choral writing, e.g. the chorus sings unison throughout. If you look at the piece and the texts, raucousness is not some odd personal preference of mine. This is not Debussy or Koechlin or some other refined fin-de-siécle stuff. It is rather simple neo/pseudo-primitivism with a Bavarian slant. Would you believe me if I told you this was my ringtone? 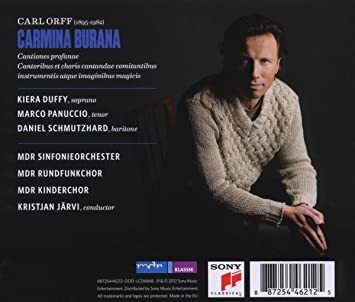 And yes, Orff deserves his own page NOT only dedicated to Carmina Burana. I like the Blomstedt as well, but I have heard him castigated in reviews. The sound is good, recorded in that famous hall. Carmina and l go back a long way. I've sung the bass part in the chorus as well as solo baritone. And back when dinosaurs walked the earth, l played timpani in an arrangement of the entire work for concert band ( yes, they actually did arrange CB for concert band, which may well prove that God really is dead ). Let me just say for the record that playing the timpani for Carmina Burana was ( expletive ) awesome, probably the only personal performing experience l would describe as " primal ". 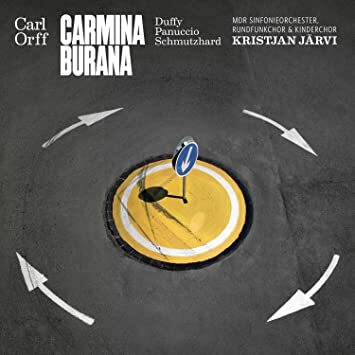 Carmina Burana is an emphatically social work, creating an emotional frisson which l believe to be unique. A successful performance will imbue an audience with tenderness, lust, joy, laughter, and an insight into the warrior's love for chaos. As far as recordings are concerned, it's Jochum on DG for me. I've owned a few others, but DF-D, Stolze and Janowitz remain unsurpassed imho, and both chorus and orchestra are more than adequate. I cannot think of another piece of music that I have liked less because of my imvolvements performing it. When I was 18 I though it was fantastic and drove my parents nuts by repeatedly playing the opening chorus at high volume. However, I find it hard to take now. I feel that most of the strophic segments are one verse too long and having been made to yell my way through it by all three conductors, one of which was John Pritchard of all people, I tend to avoid it if I can. Over the years I had about five versions, but junked them all except my first, Jochum. The soloists are great and the piece goes as well as I have heard it. Bought the DVD about a dozen years ago. Great fun, and: a great recording, too! Nice visuals, relieves some of the boredom of the music. While much of the chorus sing in unison or octaves, there are sections where they have different parts. I don't have the score and never sang in it, but I do hear chords. Actually, it's sort of fun to sing, but I never found it very interesting to listen to. But a lot of people seem to like it, and we had all sorts of people who don't generally sing show up to sing in it.